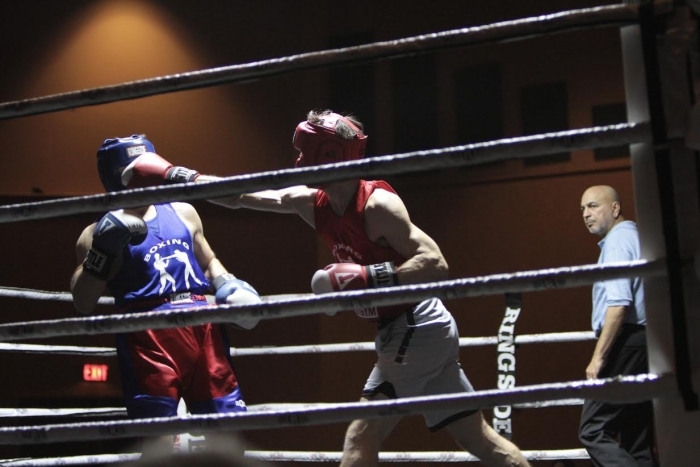 Scenes from the Wisconsin Golden Gloves Tournament held last weekend in Middleton. Photos by Matthew Jefko. A select few of the match-ups helped determine the national team that will compete in Chattanooga, Tennessee in May. The Wisconsin team now readying for the next stage consists of seven fighters: Ricardo Rodriguez (141 pounds), Marcus Johnson (152 pounds), Briana Hendricks-Che (165 pounds), Kade McManus (165 pounds), William Langston (178 pounds), Demetrius Reed (201 pounds), and Luis Alvarado (super heavyweight). The pinnacle of the state tournament came Saturday night, when a full house witnessed an exciting card that included a broiling froth of violence, technique, and the psychological intangibles that many who follow boxing simply see as a kind of sweaty, full-body poetry that happens in between the bells, inside the ring, and under a spotlight for all to see. 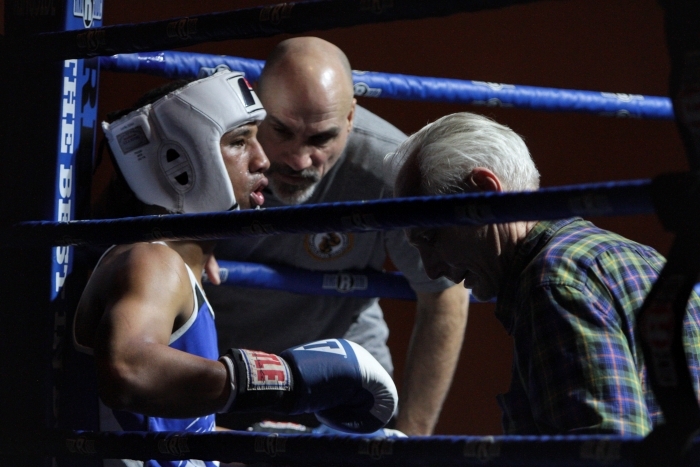 Diego Rodriguez won Saturday evening’s opening bout, fighting at 120 pounds. Rodriguez always moved forward, taking the action to Derrick Downs and earning a split-decision victory on the judges’ scorecard. In the second bout of the night, Ricardo Gonzalez defeated by Mario Martinez by unanimous decision at 125 pounds. The third fight, in which Rafael Ortega defeated Deshawn Ford at 141 pounds, saw the first standing eight count, and the first knockdown of the event. Also at 141 pounds, Juan Rojas displayed natural power and heavy hands, beating Maurice Foy in a dominant stoppage. The following bout saw Michael Daubs defeat Justice Owens at 152 pounds. Also fighting at 152 pounds, Marcus Johnson, a skilled boxer who had already earned his trip to the National Golden Gloves tournament, took part in a tune-up bout, cutting off the ring and throwing hard, straight punches to defeat Dakota Carner, who, although over-matched, made Johnson work hard to track him down in the ring. Next up, Ernest Spurlock defeated Renzo Garcia at 155 pounds. At 165 pounds, Kade McManus left no doubt in anyone’s mind in his quest for a trip to Chattanooga, sending Terrence Marquardt to the canvas in a decisive win. Also at 165 pounds, Undrakh Jargalsaikhan defeated Dominic Spinelli. Ismael Fersat, fighting at 178 pounds, beat Chris Thomas. In their fight at 178 pounds, Harley Gutierrez used a series or straight and overhand rights to stop Anthony Johnson. Fighting his way to the Chattanooga, William Langston beat Patrick Fay at 178 pounds. Fay’s corner threw in the towel. The night’s penultimate bout was also the most dramatic. Heavyweights Derris Wolfe and Gunnar Walcavich took part in a wild fight that saw a massive swing in momentum. Wolfe, the night’s biggest fighter, attacked Walcavich from the opening bell, pawing and pushing with a jab that initially shoved Walcavich into the ropes and made it hard for him to see the angles from which his opponent was throwing punches. Walcavich looked to be in trouble early on, but when he figured out how to counter Wolfe’s attacks, he did so to massive effect. Once he was able to get off the ropes, and find openings in Wolfe’s guard, Walcavich made him pay with a trip to the canvas that ended his night. In the evening’s final fight, Luis Alvarado and Demetrius Reed, who will be teammates when they both represent Wisconsin at the National Tournament, threw hard but did not fully engage. Reed’s corner threw in the towel when Alvarado started to gain the upper hand.